We took a bunch of beauty shots on the skidpad…just in case. Per hooking up the arm restraints. Craig Pelouze in the Alfa sedan chases us. The car is back in our driveway for a clean up and some work. 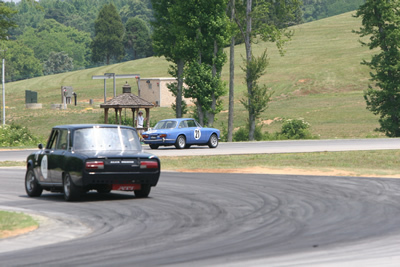 We had a lot of fun with our Alfa out at VIR at the 2007 Gold Cup Historic Races. 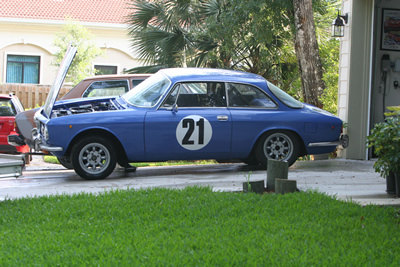 We got there Thursday morning and worked on some editorial stuff, taking pictures of the Alfa during a few free moments (as insurance in case it came back from its maiden track voyage worse for wear) and doing track touring laps in our Nissan Pathfinder tow vehicle. 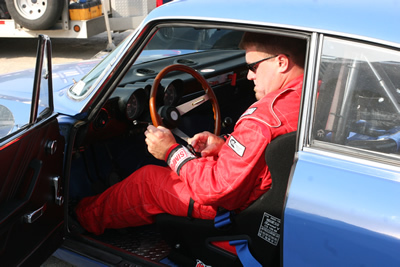 The folks at VIR were kind enough to let our “street car with a roll bar” run in Race Group B with under 2.0-liter cars, instead of the 2.0- to 2.5-liter cars in Group A. That took some pressure off our first track outing in a still-fresh car. By Friday morning, we were pumped to get our car out on track. Our first session didn’t go so well. The spade connector on the starter broke after just four turns, grounding itself against the positive terminal of the starter, making the car intermittently sputter (We’re not exactly sure the pathway there, but something odd was happening). That’s exactly the kind of thing we were trying to avoid by driving the car on a regular basis before the event! We pulled into the South Paddock and waited for a tow back to the real pits. The connector was quickly fixed and we went back out in the afternoon session. We turned a 2:45 minute lap during our second session, but weren’t particularly thrilled about how the car was pulling down the main straight. That placed us 33rd out of 43 cars in our group. The car also seemed to have a fluctuating oil pressure reading that troubled us. It turns out that the stock oil pressure gauge is typically very erratic at higher RPM and since the low light wasn’t going on, we were told to ignore it for now (until we get a real gauge) by some Alfa experts, including Peter Krause of Krause and England. We decided to change to Red Line Oil in the standard 20w50 weight. We bought the oil trackside at CDOC and with the help of a drain pan borrowed from Chris Silvestri of Scuderia Silvestri. We went back out for Saturday morning’s qualifying session and found that the car still wasn’t pulling very well and felt like it was running out of fuel under sustained load. We pulled back into the pits after just one lap. We had a sneaking suspicion that our fuel pressure regulator was actually just a fuel volume limiter (it was a cheap-o locally purchased one) and we upped the setting from 3.5 to 5 to see if that helped. It did, and we turned a 2:39, qualifying us 27th out of 43 for the afternoon’s race. The race was pretty uneventful, although a spinning Mini Cooper S caused quite a ruckus on the first lap. 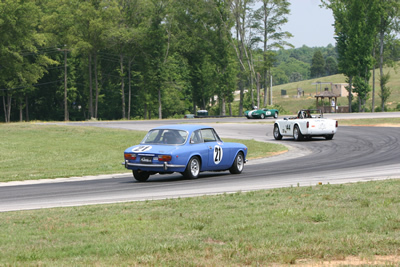 We had a good battle with an Alfa sedan driven by Craig Pelouze, who was driving one of Scuderia Silvestri’s cars, but couldn’t quite pass him on VIR’s long straights. Credit our street engine that has yet to dyno at more than 90 horsepower at the wheels. We finished 26th out of 39 starters. We had a brainstorm over Saturday evening and decided to remove the fuel pressure regulator entirely, substituting a fuel filter that we snagged from our own Gary Hunter’s infamous Triumph TR6 “Zebra Car.” Unfortunately, the Sunday morning practice session was untimed, but we had a sneaking suspicion that the car was much faster down the long straights, pulling to about 5500 rpm in fifth gear (4.10 rear end, 205/55R14 tires, stock transmission). 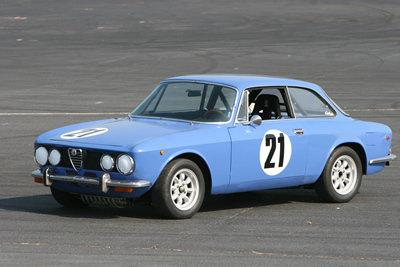 With high hopes we started the Sunday afternoon race, gridded next to our nemesis in the Alfa sedan. We took the green flag and avoided contact during the very hectic and cramped first lap. As we pulled past Oak Tree, we started gaining on the Alfa sedan and quickly passed him (turns out he had engine problems) and went on to hunt down a Datsun 510 in front of us. We couldn’t get past the 510 nor the very powerful Mini Cooper S (the same one that spun on Saturday). We finished the race 24th out 40 starters, turning a best lap of 2:35.1, which was about 10 seconds slower per lap than the winning Volvo. Improvements are good, just the same….Woohoo! It turns out that a strong Improved Touring B car in SCCA’s club racing turns about the same 2:25, which is about how our car is prepped. So, we’ve got some time to make up. Thankfully, we know where the lion’s share of the problem is, and it’s in the engine bay and has something to do with our relatively stock and untuned engine. On the other hand, we drove our car to work the day we loaded it on to the trailer, so there are compromises that must be considered. With the car back in our garage, we’ve got a laundry list of things that we need to take care of. There’s an oil leak on the timing cover portion of the head gasket that will require us to pull the head. We’re going to investigate adding some power through head modifications. We’d also like to put some real gauges in the cockpit and even add an oil cooler. We’re also going to up our rev-limiter from a break-in friendly 6000 rpm to something a little more lofty. Stay tuned for pictures and more updates soon!